Our Pre-K program is currently full for the 2019-20 school year. Please submit an application to be placed on our waiting list. Information sessions will resume Fall 2019, dates TBD. The Garden partners with Moore Montessori Community School to offer authentic Montessori multi-age Primary classrooms. Students ages 3 and 4 years old are enrolled privately through The Garden, while Kindergartners enroll through the lottery process though MMCS, and children ages 3-6 are grouped together in the Primary classrooms at MMCS campus on Pennsylvania Avenue. These prepared environments are led by Montessori-trained Guides, whom you can learn more about here. To apply for enrollment in our Pre-K program, please submit an application. To visit the school, please RSVP for one of our Information Sessions here. Students in the Pre-K program attend half days from 8am-12pm Monday through Friday. Children participate in the 3 hour work cycle during which guides provide individual and small group lessons while children are free to choose and complete their work independently. 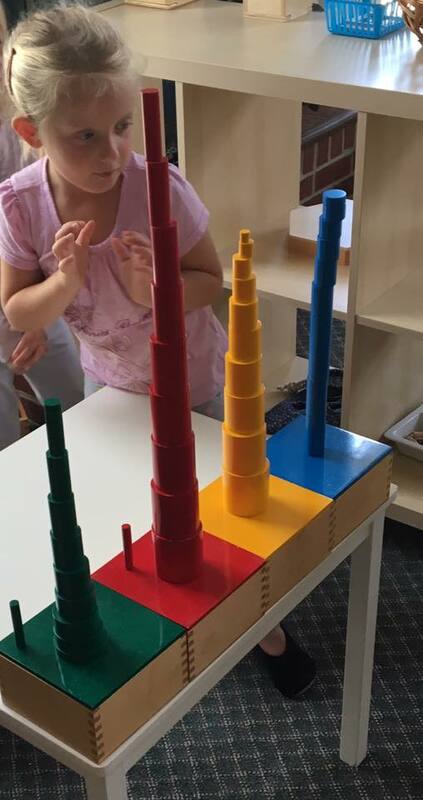 The Montessori classroom offers hands-on learning through a wide variety of materials and exercises, specifically designed to meet the needs of children within this unique developmental phase. Each child works at their own pace through a three-year sequence of materials and exercises outlined briefly below. Practical Life exercises are usually the first ones children are introduced to in a Primary classroom, they offer opportunities for children to practice and learn self-care, care of the environment and care of others, allowing for fine and gross motor development and building the child’s ability to concentrate. 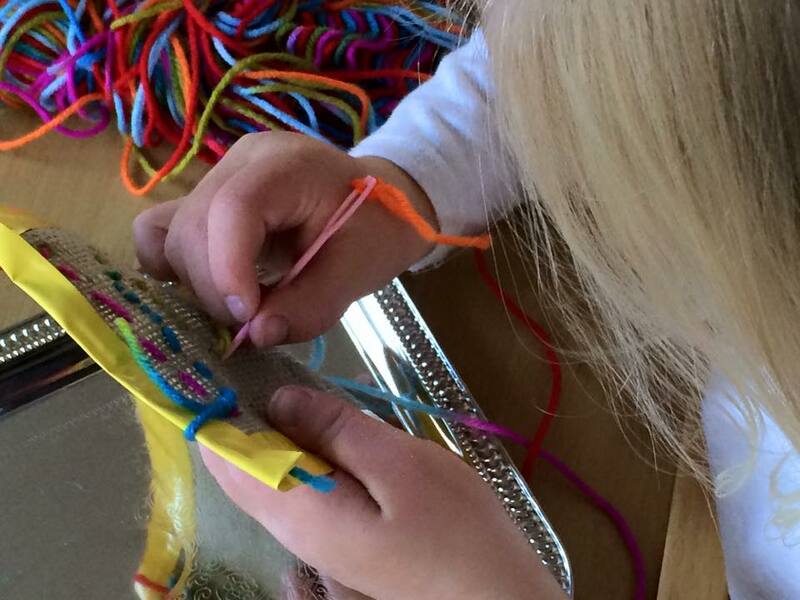 Children learn skills from pouring and polishing to embroidering and sewing, and everything in between. Sensorial materials are usually next. Beautifully designed and aesthetically appealing to the child, these materials call out to students to be touched and explored. The senses are engaged through exercises in grading, sorting and comparing; offering opportunities to expand vocabulary and prepare the child for the language and math materials that follow. The Montessori approach to reading and writing is extremely unique and effective. Language lessons begin with simple sound games. 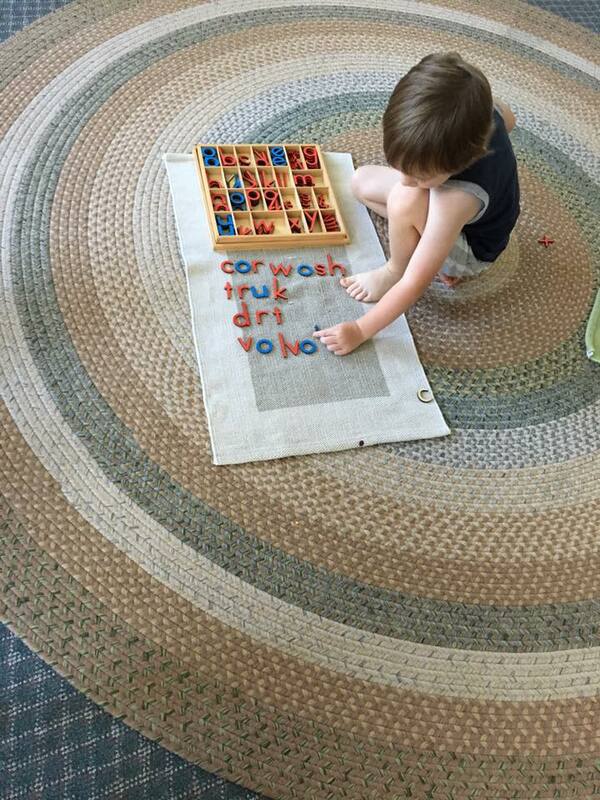 Students then learn, in fun ways and with tactile materials, how to build words and begin “writing,” using a movable alphabet even before they will use a pencil and paper, these word-building exercises lead to reading and build the foundation for literacy, often at a very young age. Students learn numbers and math using concrete materials including beads, cubes, wooden rods and tactile numerals. 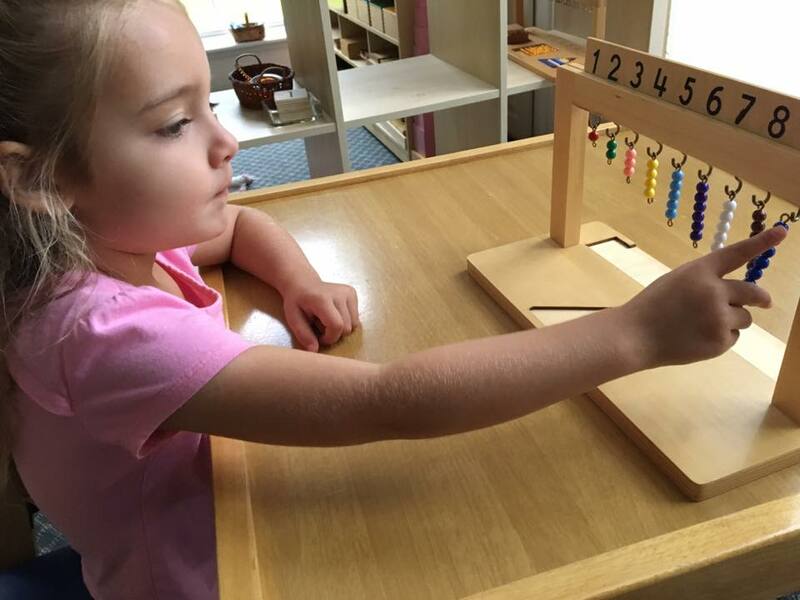 Math “lessons,” are games designed to engage even the youngest child in a Montessori classroom and allow children to discover math concepts from number identification all the way through division if and when they are ready. Since they are working at their own pace, students aren’t held back by the typical expectation for their age group and often learn concepts traditionally taught to older children. The cultural materials and exercises range widely from geography to science and history. Children learn about the world and their place within it through experiences with authentic and diverse materials that offer tangible information and teach students a deep love and respect for the earth and all creatures within it. 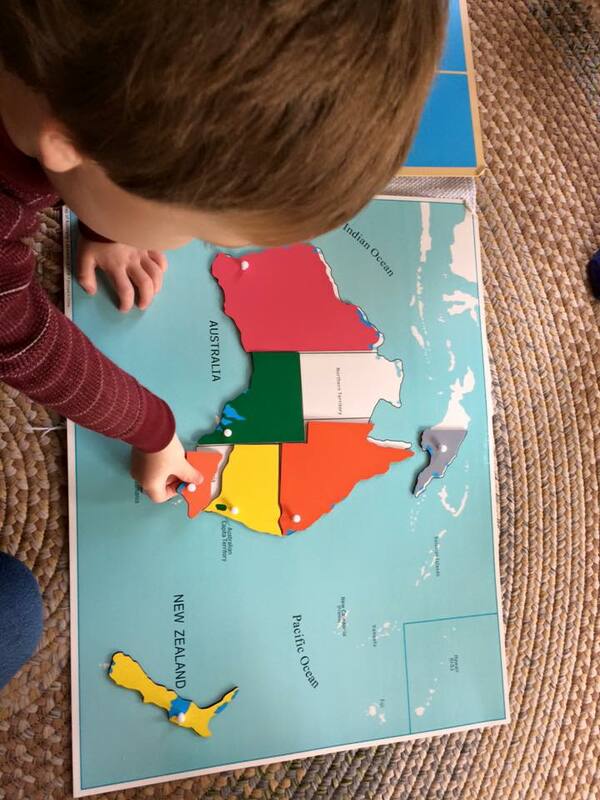 Cultural exercises are often determined by the changing seasons or the unique interest of the students, taking advantage of the natural curiosity within the child and allowing them to explore topics as deeply as they choose. Each concept in a Montessori classroom is isolated and introduced to the child in a very tangible way. Once they’ve had a presentation of an exercise, they can then practice as often as needed until the skill is mastered, or until their need for that work is satisfied. There is always more to learn, and because these trained guides tap into the child’s unique interests when presenting lessons, children are focused and happy to learn and to practice. The environment allows for children to develop intrinsic motivation without the need for rewards or punishments; Dr. Montessori found that the satisfaction of completing work and gaining a skill is all the child needs to feel inner peace and contentment. Because the children are focused on their own education, and because peace is a focus of the classroom, discipline problems in a Montessori classroom are rare but are always handled gently through lessons in Grace & Courtesy, and modeled consistently by the guides themselves.